The holiday season is on its way to York County, where a weekend getaways are sure to turn into favorite family traditions. From an annual Christmas tree lighting in the happening City of York to customary small-town celebrations, York County features several holiday getaways that are sure to end up on calendar every year. There&apos;s something magical about seeing Steam Into History&apos;s Civil War-era replica steam engine adorned in holiday garland and chugging across the winter landscape. Riding Steam Into History&apos;s Santa&apos;s Sing-a-long Caroling Train is sure to put you and your family in the holiday spirit. Listen to the Night Before Christmas before the big man in red hops aboard the train and helps lead a round of Christmas Carols. Saturday and Sunday runs will feature the steam engine, as well as hot chocolate, cookies and music in the station. If you&apos;re looking to avoid the holiday shopping crowds, consider checking out Steam Into History on Saturaday 19 and 20, when special Beat Black Friday deals allow kids to ride free all weekend. Christmas has begun the same way in Glen Rock since 1848 - with a group of caped carolers trekking through the small York County borough starting at the stroke of midnight. With roots tracing to the borough&apos;s founding family, the iconic Glen Rock Carolers spend six to eight hours walking the town and singing Christmas carols, a crowd following along for each stop. It&apos;s a quintessential small-town Christmas celebration, steeped in tradition and holiday cheer. It&apos;s the perfect time to pack a Thermos of hot chocolate, bundle up in warm coat and usher in the holiday in a truly unique way. 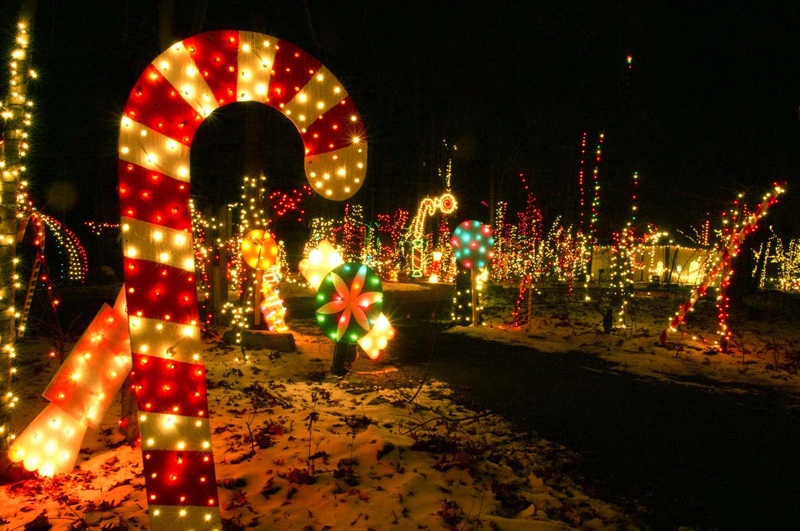 Bring the kids and warm up with some hot chocolate during a holiday stroll through 600,000 Christmas lights, holiday scenes, train displays and more during Christmas Magic - A Festival of Lights at York County&apos;s Rocky Ridge Park. The half-mile walking trail, accessible to anyone, meanders through a forest nestled on a quiet mountaintop. The annual holiday celebration has earned acclaim in The Philadelphia Inquirer and the Wall Street Journal. One visit and Christmas Magic will quickly become one of your favorite annual holiday destinations. The event runs November 24-December 31, and is closed Christmas Eve and Christmas Day. Visit Downtown York on December 2 for its annual tree-lighting ceremony, Light Up York. The event happens during First Friday, meaning the historic Central Market House and other Downtown York shops will open for extended hours, perfect for any holiday shopping you might want to do. This year&apos;s tree-lighting ceremony will also feature the unveiling of the finished time capsule celebrating York&apos;s 275th anniversary. For something really unique, come back on Christmas Eve to hear Christmas carols played on a factory steam whistle. The music echoes all across York, and the local tradition actually made the Guinness Book of World Records as the loudest music played without amplification. The Strand Capitol Performing Arts Center will feature holiday programming throughout December, with The Nutcracker, A Christmas Carol and more on the schedule. Plus, if you&apos;re interested in visiting York during the most wonderful time of the year, we have plenty of special holiday lodging packages for your December getaway!